In the Market for a Free Personal Assistant? Manilla automates so much of your household and financial life, you'll think you have a personal assistant. Manilla is a secure and intuitive online tool that allows you to quickly see balances, pay anything from utility bills to insurance statements, and manage your travel rewards programs, daily deals and subscriptions in one convenient dashboard. 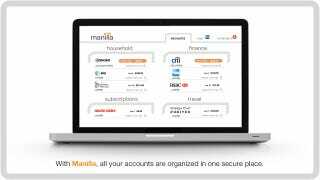 Manilla provides current balances for all of your accounts and organizes your account mail. Manilla retrieves, organizes and stores your important bills and statements for you, so you don't have to wait for, nor deal with, paper mail. Who knows how long it will take to get anything in the mail this year? With just one site, managing paper clutter, shredding old statements and manually filing documents are finally a thing of the past. Manilla also automatically reminds you when bills are coming due and when miles, points or deals are expiring. With custom reminders and easy access to all of your balances, Manilla makes it easy to stay on track. That is a good feeling, especially knowing that U.S. consumers spent more than $22 billion on late and penalty fees for credit cards in 2010 alone, according to credit.com. Eliminating late and penalty fees, improving your credit score and keeping your points aren't the only ways you'll save—because Manilla is completely free. It's absurdly easy to register, and daily use is just as seamless. Signing up takes less than 90 seconds, and adding new services is frequently no more than a few clicks. There are more than 1,200 national and regional accounts supported today, and more are being added each week. Manilla's made privacy and security its first priority, so all of your personal information is stored behind bank-level protection protocols. So while other people can't get a hold of your data, you can access your account information from anywhere at any time of the day. So start the year out with a great new tool—Manilla, your free personal assistant—and start saving time and money. Click here to sign up.